Are Santa Claus and Grandfather Frost the same? Let’s talk about differences between Western Santa Claus and Grandfather Frost. 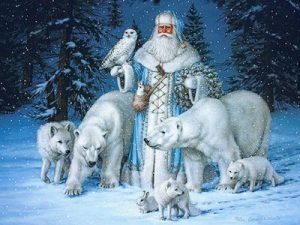 Recently Russian Grandfather Frost became somewhat westernized, and younger generation of Russians cannot clearly distinguish one from another. During recent times Grandfather Frost began looking more and more like his Western cousin. The only thing that Grandfather didn’t give up – his granddaughter Snow Maid… She is still following him during winter holidays. As I explain the differences, let me go back to early traditions and character of Grandfather Frost. First of all, Grandfather frost has nothing to do with Christmas and Christianity. He is an ancient pagan god of Slavs. He was not a kind character, but instead is powerful, strong, sometimes cruel and protective. He was famous for helping Russians win several wars against their enemies. Many times, in Russian history he froze foreign troops, helping Russians defeat the remaining invaders. Remember the story about Napoleon who lost his army and his glory in Russia during unusual, even for Russia, frigid cold in winter of 1812? Well, that was Grandfather’s doing. Yet, in spite of his reputation, Grandfather Frost is always taking care of plants and trees, covering them with snow blankets. He is a protector of wild animals and is often followed by bears and wolves. Grandfather Frost does not drive reindeers, at least he never used to. Sometimes he drives three white horses in an open sleigh. But most of a time he walks, which is why he is in such a great physical condition regardless his age. He doesn’t have “ beer gut”, or cookie gut as does Santa Claus. He also has teleportation capabilities, as he can appear instantly wherever he wants. Grandfather Frost would never even think to get into any chimney, and until 20th century he would never have appeared in anybody’s house. Maybe he was afraid to melt? Since the time of changing his character from gifts-receiver to gifts-giver, Grandfather Frost used his magic to bring presents to children without showing up. But again, during the last century he changed his habits and started showing up at winter holidays parties bringing a bottomless bag with unlimited presents in it. Traditionally Grandfather Frost wore a long winter coat trimmed with white fur. His coat was silver or blue with a lot of crystal accents. During Soviet times, Grandfather Frost had to wear a red coat to match the Soviet flag. You must agree that the red color looked ridiculous in winter snowy surroundings, but, hey!, you have to do what you have to do. Nowadays, he returned to his traditional outfit, although some of Grandfather Frost characters still wear long red coats. I assure you if you see a Grandfather Frost dressed in red coat today, he is not the “real” one. Grandfather Frost wears white long pants and white Russian-style shirt under his coat. But to see his under-coat clothes would be totally against the real traditions. Grandfather Frost prefers “valenki” – traditional Russian winter footwear made of wool felt. They are the most comfortable and warm winter footwear for coldest Russian winters, but they are not precisely beautiful. On some special occasions Grandfather Frost wears fancy silver boots instead of “valenki”. He also wears a white fur trimmed hat with velvet of brocade top. One of the most important Grandfather Frost’s accessories is his magic rod. It is made with ice and silver, with the top being a silver crescent moon. The rod has the power to freeze anything it touches and also create winds and snow falls. Well, enough history. Time to start working on my Grandfather Frost’s costumes and accessories. It will take awhile.